The spring in Big Crow Basin is a perfect spot for a brief break. Before we left our sloping meadow by the stream, I packed up the tent that had been spread out in the warm sun to dry during our rare leisurely break. We consulted the map to find that we had about another mile to climb, an ascending traverse over the shoulder of Norse Peak to reach Scout Pass. We soon left the lush meadow setting for trail carved into a steep dry slope of volcanic red-brown scree and sand. There were still a few trees and a surprising number of wildflowers along this section, primarily species of lupine, paintbrush and larkspur, and some yellow aster or daisy-like flowers. Well below us sat dramatic tree-filled Lake Basin under a blocky brown crag with steep vegetated slopes. While it holds only a single lake, the water of that lake was unlike any other we have ever seen. We rejected about 10 green shades before finally settling on jade as the best description of the pale but intense, opaque green water. Needless to say, it was a stunner. After stopping for a few photos we continued our narrow traverse up the loose slope. Huckleberry was in front, as usual, and said she thought there were horses at the pass. Given the terrain we hurried to reach them before they started on the narrow trail towards us. As we came closer, it became apparent that there were two horses with riders, and they were waiting for us to complete this section before continuing. Horsewomen heading down the narrow traverse to Big Crow Basin. We called out hello to the two horsewomen, to which they responded, "Do you want some grapes?" It seemed like we must have mis-heard them but we incredulously said "Yes!" in unison. One pulled out a bag of red flame seedless grapes and handed down a bunch for us to share. We introduced ourselves, met their horses Big Boy and Reba, and thanked them for waiting so we didn't have to find a place to step aside for them on that steep & loose slope. The grape lady laughed, told us the horses saw us way across the basin & alerted them. Also, her friend already had enough reservations about riding that narrow trail, let alone contending with hiker traffic. The friend interjected that it had better be the only section of trail like this all day, and she was probably going to have to close her eyes through it. We all laughed. They told us about their camping trip and all of the wildlife they see near here, especially the elk at night and mountain goats during the day. We were still eating grapes when she pointed and said "look!" We all turned around to see two mountain goats sprinting straight down the steep slope we had just crossed, without a care in the world. Their white coats were a vivid contrast to the dark reds, browns and greens of the landscape. Huckleberry, especially, was excited to see them as she has never seen wild goats or sheep despite backpacking in their ranges on multiple occasions. It was double trail magic - unexpected fresh fruit, and mountain goats in the wild. We stayed a few minutes longer to watch the horses easily navigate the trail. Just Wow. Mt Rainier from Scout Pass. Crossing Scout Pass the first thing we saw was the massive hulk of Mt. Rainier, much closer than the last time it was in view. We were across a steep narrow valley from a green ridgeline with patches of snow, and rising directly behind that was the giant white mountain. The far slope of this valley holds the ski lifts of Crystal Mountain, and we discussed how ironic that from the ski slopes, you wouldn't be able to see Rainier at all despite its proximity. It was a warm day and we didn't mind that the morning's steady breeze had transitioned into constant wind. The trail continued a long meandering traverse just below the ridgeline all the way around the end of the valley. In areas where we transitioned from one slope to another through exposed gaps the wind was quite strong and we had to be extra careful about "not walking and gawking" (a helpful piece of advice offered by a ranger on New Zealand's Milford Track, which we often refer to when backpacking). With every turn Rainier would show up on the horizon. We continued to have stellar views of Rainier throughout this long traverse, and soon we had our first views of Mt. Adams to the south. In many spots we had panoramic views containing both Mt. Adams and Mt. Rainier, making for a spectacular if gusty afternoon. We crossed Fog City pass with no fog in sight and joked that it should be re-named the Windy City pass! Finally, we left the valley of Crystal Mountain behind for the climb to Sourdough Gap. It was getting late in the day, and we always think about food, so Huckleberry started wishing for a nice stack of sourdough bread bowls at the gap (spoiler alert: no bread bowls). Despite the lack of a mountaintop bakery, the narrow gap had fantastic views in both directions, including one of the alpine lake in the basin below that was tonight's destination. As per usual, it seemed to take forever to actually reach the lake via the switchbacks and meandering of the trail. Alpenglow on the peaks above Sheep Lake. Thea the trail magic pixie of Sheep Lake. Piling on the Mac and Cheese. When we finally reached the lake we found a large group with kids camped at the near shore and continued across a wooden bridge over the outlet to find another spot. We headed for a knoll with a flat area and discovered Spice Rack and Crusher cooking dinner. They weren't planning to stay as their 27-miler required another 5+ miles, but were waiting for Candy Cane who had been on the struggle bus that day and was lagging behind. We set up camp and made our dinner, and sat around eating together. Candy Cane made it in and they decided to wait a bit and re-assess whether to continue so she made her dinner, too. Meanwhile, the kids across the lake were singing loudly on the rocks and it sounded like a song about dried fruit. We joked that thru-hikers are always hungry. Then one kid called out to another that she wasn't going to eat her mac & cheese, and did anybody want it? Candy Cane immediately called out across the lake "I'll eat your mac & cheese!" And we all laughed. Not 5 minutes later young Thea came walking up to our campsite with a pouch of mac & cheese, saying that if we had bowls she'd give us some. To which Candy Cane replied, "Oh, we have bowls. Don't you worry about that!" Thea asked where we were from, if we were hiking the PCT, and how far we had walked today, and was duly impressed by all of our answers. She then proceeded to scoop all of the remaining Mac & cheese into Candy Cane's bowl, right on top of her instant mashed potatoes (the rest of us declined her offer). Kudos to the trail magic pixie! After she finished eating, the three of them decided to stay at Sheep Lake after all since it was nearly 8:30pm. It was a bittersweet decision due to the birthday goal, but clearly the best from a hiking perspective. Instead they sang happy birthday to Spice Rack and ate the Belgian chocolate gifted by the WA section hiker at yesterday's spring in honor of her upcoming celebration. Scarlet paintbrush in the alpine meadow. Wildflowers just after Chinook Pass in the alpine meadows. The wind howled all night, causing our fly to shift against the tent pole making an eerie noise and blowing fine sand into the tent. When I got up to make brekkie, I had to use a tree as a windbreak to keep the stove lit, not and ideal start to Day 22, but hey, that's life on the trail. 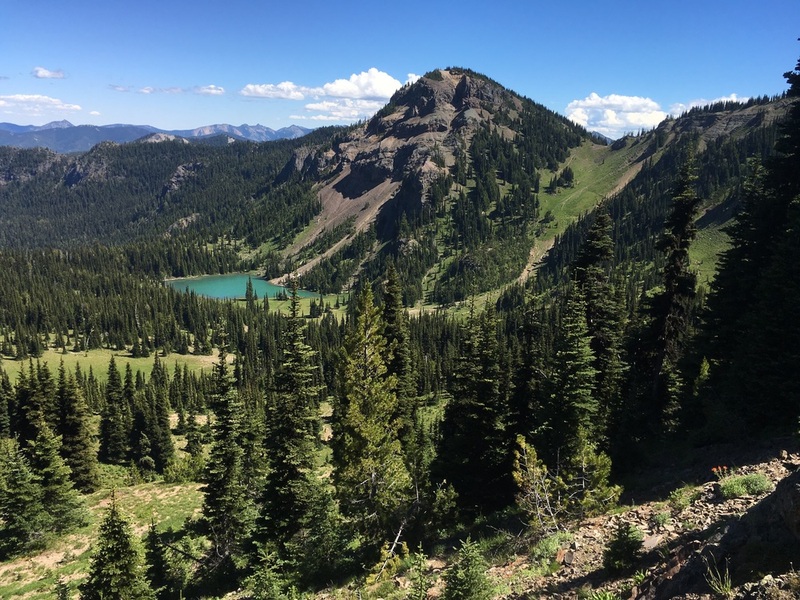 Once the sun was up, the wind died down and it was completely still so we enjoyed a beautiful and still morning hike down to Chinook Pass, where the PCT crosses Hwy 410 and enters Mt. Rainier National Park. 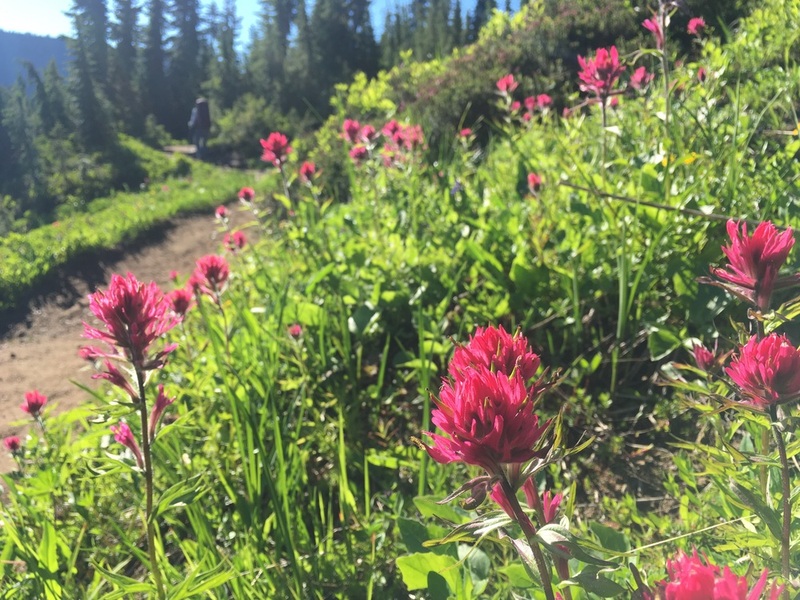 We hiked through some classic WA alpine terrain - sloping meadows filled with wildflowers including gorgeous little lilies with white to pinkish petals and yellow centers, scarlet paintbrush and lupines. Water flowed down numerous seasonal streams and patches of snow lingered on the hillsides above. To top it off the sky was brilliant blue to contrast against the dark rock of Naches Peak. We couldn't have asked for a more idyllic morning. From there we decended down to Dewey Lakes and learned first-hand where a good portion of the state's mosquitos had been hanging out. We were swarmed. We cut our brief rest stop there even shorter and kept moving. This would become a recurring theme for the next 24 hours. The one upside was that around nearly every turn of the trail we continued to enjoy stellar and ever-changing views of Mt. Rainier. The massive mountain dominated everything that we saw in this section. It was no longer a paint by numbers mistake, it owned every scene. We kept stopping & gawking to take in the views, knowing that soon we would be past Rainier and as we headed south it would start to recede. We started the long descent towards Bumping River and lost our Rainier. The trail got hotter and drier as we dropped elevation. When we passed Candy Cane, Crusher and Spice Rack having a little shady siesta at a trail junction, Huckleberry was envious. But we kept traveling down and made our way into the what we would disaffectionately call the Valley of the Mosquitos. This is how we combat the mosquitos, or we use DEET. Bumping River is shown on maps as a ford, but we found a large log a bit downstream and stayed dry. We had a snack on the far side and directed a few hikers to the log. Their border collie, complete with backpack and cow bell, preferred to ford the river no fewer than 3 times while they made their way to the log. The mosquitos weren't bad at the river but once we started our climb we unwittingly walked right into their lair. The slope flattened out in a broad undulating basin that is mostly forested with several small lupine-filled meadows. It is littered with shallow lakes, ponds, and marshes. While beautiful, the entire area was a cesspool of mosquitos and it felt like walking the gauntlet to get to our campsite. As the crow flies the basin is fairly small, but the trail undulates around every body of water making it seem endless. This gives every single mosquito and its cousin a chance to bite you. Basically, the basin is no bueno. At our campsite, just setting up the tent allowed 30 or so of them in. Huckleberry made dinner wearing her rain pants, jacket, rain gloves and mosquito head net. We ate dinner in the tent and leaving it meant getting bitten on your ankles about 20 times because that was the one place not fully covered. In the morning, we finally broke down and used DEET for the first time this trip. We hate the stuff and only use it in dire cirumstances, but this definitely qualified. It worked and we hiked out to White Pass with the help of DEET, head nets, and keeping up a very brisk pace (sometimes we were almost running). Every hiker we passed looked the same, and we exchanged grim smiles with each. We finally reached the trailhead and started the 0.6 mile road walk to the Kracker Barrel store. The highway was windy and hot but had NO MOSQUITOS. I can honestly say that we've never been happier to walk along the shoulder of a highway. We arrived at White Pass to see both familiar and new faces. We had passed Candy Cane on our way and unfortunately she still looked to be on the struggle bus. Crusher and Spice Rack were waiting for her, eating snacks they found in the hiker box. They planned to zero with a friend who lives nearby. Nuthatch and Sherpa had come in last night, stayed at the lodge, and were getting ready to hit the trail. Sherpa was sporting new shoes, and they are planning to pick up the pace (!) since they need to go off-trail in August for a wedding. We are sad we won't see them for a while, but expect they will ultimately pass us once they return and start hiking again. We met a few members of the infamous "Dirty Dozen," now down to 5 and re-named the Wolf Pack. We started about a week behind them but it looked like we were catching up. There was also a smattering of NOBOs. Edie and Simon showed up with snacks (fruit! sandwiches!) and our resupply goods. We spent a few hours catching up with them, eating and repacking our supplies. They kindly drove us down the highway back to the PCT, and waved goodbye as we hit the trail.